President Bush said Tuesday the United States will turn over former Iraqi leader Saddam Hussein to the new government in Baghdad at a later time, contradicting the interim prime minister's claim that the handover was imminent. The president declined to set a timetable, saying "appropriate security" must first be in place. Neither the United States nor the new Iraq government wants there "to be lax security and for Saddam Hussein to not stand trial," Mr. Bush said in a Rose Garden news conference with Afghan President Hamid Karzai. U.S. officials have also said they plan to continue to hold up to 5,000 prisoners deemed a threat to the coalition even after the restoration of Iraqi sovereignty at the end of this month. Earlier, interim Prime Minister Iyad Allawi had said the former Iraqi president and other detainees would be transferred to Iraqi authorities in the coming two weeks. Allawi said Saddam would stand trial "as soon as possible" but gave no specific timeframe. The former Iraqi dictator has been in U.S. custody in an undisclosed location since he was found last December, but his status has been under discussion as the U.S.-led occupation's end approaches. Occupation spokesman Dan Senor suggested that U.S. authorities had grounds to hold Saddam far beyond the handover ceremony, saying the Americans could keep him "until the cessation of hostilities," which, he said, aren't expected to stop on June 30. He said the U.S. goal is to put Saddam "into Iraqi hands sometime after June 30." "I wouldn't call them negotiations," Senor said. "I would call them discussions. 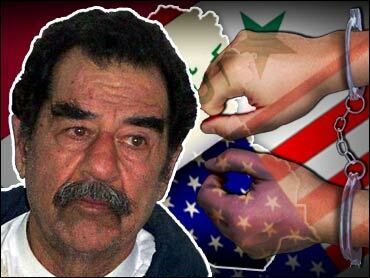 Both sides have an interest in handing over Saddam Hussein to the Iraqis. The only matter is when is the appropriate time. That is something we are discussing with the prime minister right now." Iraqi authorities hope to file criminal charges against Saddam Hussein and other top officials of the former regime before the transfer of sovereignty to the new Iraqi government at the end of this month, a senior official said Tuesday. "I suspect that there will be an arrest warrant filed not only against Saddam but also against the other high-ranking officials before June 30," said Salem Chalabi, an Iraqi official in charge of setting up a tribunal to charge members of the ousted regime. "We have been working quite hard in the last few days on that, believe me," Chalabi said. Chalabi said that he believes Iraqi authorities will have cause to hold Saddam if he is handed over by the Americans. The International Committee of the Red Cross has indicated that under international law, Saddam must be charged or released after the formal end of the occupation since he was detained as a prisoner of war. "Repatriating Saddam Hussein to Iraq to be tried by the war crimes tribunal is what the Geneva Convention requires and a strong statement to the world confirming the end of the occupation," said CBS foreign affairs analyst Pamela Falk. Interim President Ghazi al-Yawer said Mr. Bush is eager to hand over Saddam, but Iraq must have adequate security guarantees in place before the government can take custody of him. "Even President Bush himself was asking me," al-Yawer told reporters in Baghdad after returning from the G-8 summit in Sea Island, Georgia. "The United States is very keen to hand over the ex-president to the Iraqi authorities." Al-Yawer cautioned that security precautions must exist in order for Iraq to be able to take custody. "We must first make sure that we can maintain protection for his life until he goes to trial," al-Yawer said. "We must make sure that the trial goes as a legal process, he has his own fair chance of defense and the government has its own chance." The six-month old Iraqi Special Tribunal which Chalabi is organizing has struggled to put appropriate security safeguards in place. War crimes experts have cautioned that as long as violence prevails in Iraq, the trial of Saddam and at least 100 others suspected of committing atrocities against the Iraqi people should wait — unless a foreign venue can be found. Judges have refused to work for the tribunal after five potential candidates were killed since Saddam was toppled from power last year. Tens of millions of dollars have been spent on security alone. Also Tuesday, Al-Yawer said that the sovereign Iraqi government will insist that the United States give up control of Saddam's palace used as the headquarters of the U.S.-run coalition and return it to Iraqi control. U.S. officials have said they plan to use the Republican Palace as an annex for the new U.S. Embassy which will assume its duties after the Coalition Provisional Authority dissolves at the end of the month when Iraqi sovereignty is restored. "There is no talk of inviting the United States to keep the Republican Palace as an embassy supplement," al-Yawer said. "We asked that the Republican Palace be vacated in the fastest opportunity for us to use it as Iraqis, as a Republican Palace or a museum," al-Yawer said. "Whatever we do with it is a matter for Iraqi sovereignty. It is a symbol of Iraqi sovereignty."